We are located in Montana. Our home sets on 20 acres in the country just outside of Broadview, MT. We have numberous pets including cats, in and outside birds, an Alpaca, goats and a horse. 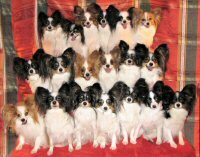 Our Papillons are raised inside the home with us, not in an outside kennel by themselves. We fell in love with this breed as soon as we met one. They draw attention everywhere they go. We rarely go anywhere without some if not all of them with us. They are very affectionate and fun to have around. They are the joy of our lives. 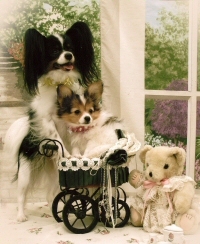 Our little joys are very spoiled and well cared for, just ask their vet. The girls are health checked before, during and after their pregnancy. All have their eyes, heart and patellas checked before they are bred. We are very conscientious of their health and nutrition. 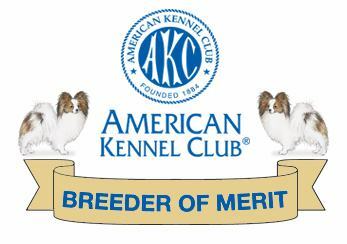 All of our adults and puppies are AKC reg. with champion bloodlines. They are the only breed we raise. The pups come with a health guarantee. We are more than happy to speak with you about the breed or help you find a puppy that will suit your family even if it is not one of our pups. If you are thinking about joining the show world we will try to help you there as well. We do a lot of showing throught the year as we are lucky enough to be in the center of many shows in our region. They are anywhere from 30min to 8hrs away. We do take the winter off. We have been lucky to meet and make wonderful friends throughout the country. The breeding that we do is to improve on our lines as well as the breed. Pedigrees are a corner stone but there is so much more entailed in finding a reputable breeder as well as a healthy and beautiful puppy. We will not make remarks against other kennels on our website as we feel that is unprofessional, however we can give you tips on how to look for a reputable breeder. I have also co-produced a grooming video.